The miraculous and romantic story of Shakespeare’s First Folio, and of the American industrialist whose thrilling pursuit of the book became a lifelong obsession: “Mays’s narrative is so fast-moving, and peppered with such fascinating detail, it almost reads like a thriller” (Entertainment Weekly, Grade: A). When Shakespeare died in 1616, half of his plays died with him. No one—not even their author—believed that his writings would last. In 1623, seven years after his death, Shakespeare’s business partners, companions, and fellow actors gathered copies of his plays and manuscripts and published thirty-six of them. This massive book, the First Folio, was intended as a memorial to their deceased friend. They could not have known that it would become one of the most important books ever published in the English language. Over two and a half centuries later, a young man fresh out of law school, Henry Folger, bought a book at auction—a later, 1685 edition Fourth Folio, for $107.50. It was the beginning of an obsession that would consume the rest of his life. Folger rose to be president of Standard Oil, and he used his fortune to create the greatest Shakespeare collection in the world. By the time he died, Folger owned more First Folios than anyone and had founded the Folger Shakespeare Library, where his collection still resides. In The Millionaire and the Bard, Andrea Mays spins the tale of Shakespeare and of his collector, of the genius whose work we nearly lost, the men who had the foresight to preserve it, and the millionaire who, centuries later, was consumed by his obsession with it. “Effortless in its unadorned storytelling and exacting in its research, this is a page-turning detective story” (Publishers Weekly). Andrea E. Mays has degrees in economics from the State University of New York at Binghamton and from UCLA, and teaches economics at California State University at Long Beach. Like Henry Folger, she is a native New Yorker and has had a lifelong Shakespeare obsession. She spent much of her Manhattan girlhood in the New York Public Library listening to vinyl LP recordings of performances by the Royal Shakespeare Company. 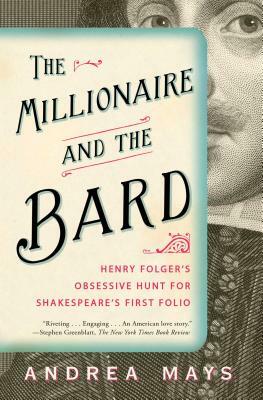 The Millionaire and the Bard is her first book.